The Arab world had greatly benefited from the West in terms of technology and trade but are Western influences eroding their time honoured traditions and culture? For instance, there was a time if someone was in trouble everyone from friends to strangers would rally round? Sometime ago I sat next to a group of young Arab men in a coffee shop and couldn’t help noticing that one received a call from his housemaid to say his home was on fire. He jumped up; made his excuses and left. The surprise was this. His ‘friends’ merely said “no problem”, wished him “luck” and carried on with their coffee and chat. For a while I sat totally bemused. At one time everyone on the table would have rushed to help their friend in his time of need no matter the inconvenience to themselves. This kind of attitude may not be prevalent. It could have been a mere one-off but, nevertheless, it started me thinking about the days when business was done on a handshake and hospitality meant taking in strangers for up to five days. As someone who has lived in various parts of this region for over 25 years, I’ve seen many changes. Since the first day I stepped foot on Arab soil in the early 1970s to work in Algeria the buildings everywhere have got taller, the traffic more congested and the countryside greener. 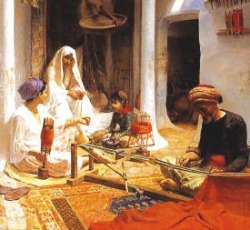 Almost all Arab societies have embraced the 21st century with vigor together with its accoutrements such as computer notebooks, I Pods, and all-singing, all-dancing mobile phones. In wealthier societies, youth are handed the keys to spanking new automobiles almost as soon as they learn to drive. Children are driven to school and to all their extra-curricula activities, unlike their parents who often had to walk miles in all temperatures. Italian-style coffee shops have replaced cafes where old men once played backgammon and contemplated life as they puffed on their water-pipes. The heart-grabbing emotional strains of Umm Kulthum have been drowned out by the gyrating Nancy Ajram. For the late explorer, photographer and author Wilfred Thesiger, who in 1946 crossed the Empty Quarter with two young Bedu companions, these changes were anathema. This is called progress and like the tide it cannot and should not be turned back. Thesiger might have found a certain romance in a hardy existence but if they are honest few locals miss those days without air-conditioning when families were driven to sleep on their roofs during hot summer nights. But we should not forget that while the old days were tough the people were tougher but inside they retained a certain human to human sweetness that isn’t so evident today, although it could well be lurking under the surface. There is almost tangible beauty in the Arab character, based on centuries of tradition, which I hope will somehow survive this fast consumer/computer age. For instance, I can never forget the Bahraini taxi driver who in 1975 waved at me in the street to return an expensive camera I had forgotten in his cab three months earlier. Or the Egyptian driver, who, some years later, drove all the way back to Alexandria from Cairo when he discovered that my gold bracelet had slipped down the seat of his taxi. I will always be grateful to the Algerian family who took me into their simple village home after I was involved in a car accident. The lady of the house had given birth to a daughter the day before but that didn’t deter her from tending to my wounds and covering the table with food while her husband towed my car to the nearest town for repairs. During 16 years in Dubai, I was the recipient of countless kindnesses; too many to mention. Total strangers would urge me to participate in their wedding celebrations. Every time my car had a flat tire, tens of vehicles would stop, their drivers eager to help. When I fell ill with the flu, neighbours would turn up bearing chicken soup, pastries or old-fashioned remedies.When Kuwait was invaded in 1990, Dubai opened its doors and its pockets to Kuwaiti refugees, who were housed and given monthly living allowances. Many hotel and apartment owners put their properties at the disposal of Kuwaiti visitors without thinking of reimbursement. It was a fine example of brotherly love, which is rarely seen in other parts of the world. Just the other day I saw a report on Fox News about an American woman who lay dying on a petrol station forecourt. Apparently three people stepped over her. Nobody offered any help. Something so callous and uncaring could never happen here. During these troubled times when the Arab way of life is often viciously attacked by the Western media I often feel my blood boil that there is so much ignorance out there. They like to portray Arab women as being mistreated when most are treated with the utmost respect and are queens in their own homes. And where else in the world do men still open doors and pull out chairs for ladies? 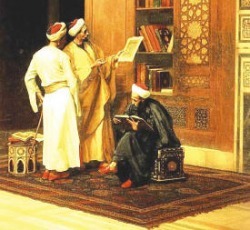 They often scoff at the concept of Arab ‘karama’ or dignity when this is surely all that a man has when he loses everything, and without it he is not a man.They like to paint Arabs as backward when the West should be grateful to the Arab world for mathematics, algebra, science, astronomy, medicine and written language. It was here that man first cultivated grain, raised livestock, and established great cities. It was in this region that the world’s great monotheistic religions – Judaism, Christianity and Islam – originated.And it was the Bedouin who created a time-honoured code that lives in the veins of all Arabs today. These people who endured so much hardship as they wandered throughout the harsh desert sands from oasis to oasis were perhaps the most honourable of all. One thing I pray will not be sullied by globalization is the respect and love which Arabs famously show to their parents. At one time, children would kiss their parents’ hands each morning and would never dare to raise their voice to either their mother or father. That may not be as true today, but just last week I was pleasantly reminded of its ongoing existence when a young Egyptian man and his elderly father turned up to paint our house. I noticed that the younger man, who has worked for us before, regularly downed his brushes before disappearing into the furthest recesses of the garden. I was later to learn that his outdoor sojourns were spent smoking far away from the eyes of his father, whom he told me he respected too much to ever light-up in front of him.Arabs have every right to be proud of their heritage and way of life. It is true that there are certain customs which require change in keeping with the modern-day world but there are so many others that have stood the test of time and should be preserved if at all possible. In March this year, Sheikh Mohammed bin Zayed Al Nahyan, the Crown Prince of Abu Dhabi and Deputy Commander of the UAE Armed Forces urged his fellow Emiratis to uphold their age-old traditions, which he said should be inculcated in the younger generation to help mould their identity. In April, Sharjah staged “Diving Deep into Culture”, a 16-day event, which brought to life traditional UAE customs and showcased the country’s traditions, history and heritage. In 2003, the Zayed Centre for Heritage and History began a nationwide hunt for senior citizens “whose lives are a testament to the traditions, culture, society and daily life in the days before economic development got into full swing”. This was done with the aim of preserving and documenting the country’s history and culture “to create a balance between original and contemporary life”. Those are valuable efforts made by people who value their past, appreciate their roots and are taking real steps to ensure the next generation know and value themselves. This people of this region may have their eyes on the future but as long as their hearts are firmly grounded in the values of the past, there is light.Over the decades this part of the world has become my home. But the glossy high-rise, the theme parks, the swish boutiques, the marbled malls and the elegant hotels aren’t the main attraction for me. Far more captivating is the warmth of the people and their inherited values they hold so dear. Indeed, I feel a sense of privilege that for so many years I have been allowed to share those values together with their innate sense of hospitality, dignity and love of humanity. I thank them, all of them, for hopefully making me a better person than I once was.